There is a place which is truly wild whilst being contained within man-made walls; a place where common creatures dwell and yet are like no others of their kind; a place where one can find solitude and society simultaneously; a place which is amplified in magnificence within the imagination and yet exceeds expectations when experienced in reality. To be invited to spend time here, beside The Moat is a true privilege and certainly not something I will ever take for granted. However, the idyllic nature of the venue does not imply the fishing is easy. In fact, at times it can be infuriatingly difficult! The rewards of perseverance however, can be plentiful. 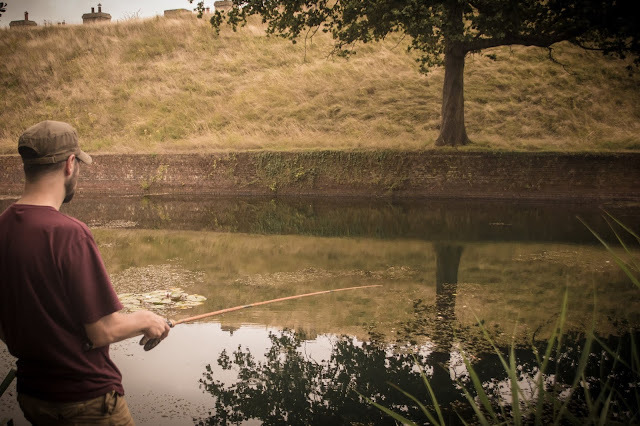 As per previous visits, in order to make the most of my allotted time here, I employed traditional float fishing tactics by day to target crucians and then fish with modern methods by night for carp. This seems to allow me to maximise the opportunities available to encounter the unique specimens that inhabit the moat. Fishing commenced mid-afternoon on a humid and overcast Friday. I decided not to feed any freebies or groundbait at all at first - an approach I often take at the beginning of a session as I don't know what has gone in before my arrival and if there are already hungry fish present, then I want them to take my bait first before they become preoccupied with anything else. Sure enough, no sooner had I cast in a carefully formed bread flake, the float lifted and then glided off stage-left towards the curtain of nearby lilies. I bent into a very strong-willed male tench, quite adamant not to be netted, making several lunges into weedbeds and generally wreaking havoc! 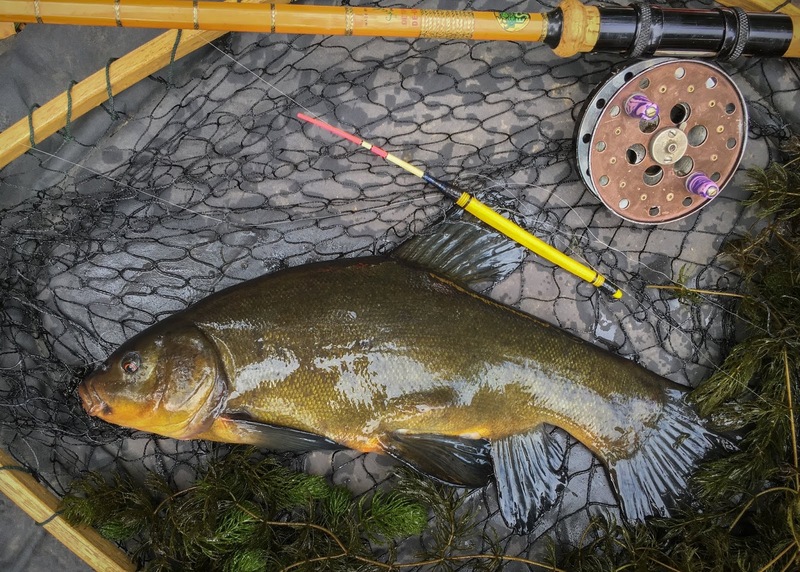 To me this tench is something of an archetype. Dark and decedent on the dorsal line blending through British racing green down to its mango undercarriage. It glistened in the light as though it had been painted with 6 coats of yacht varnish and looked on patiently through its beady red eyes. Two other slightly smaller tench followed, decimating the swim in a similar fashion and then the bites dried up. I fished until I could barely see my motionless float. Just before I decided to call it a day and set up camp for the night the smallest, barely distinguishable movements came from the silhouetted swan-quill. I had been introducing small amounts of groundbait - as per the rule, very little, very often, in the hope it would generate some interest in my hook bait. Before long the activity snowballed into a confident lift which I did not hesitate to hit. 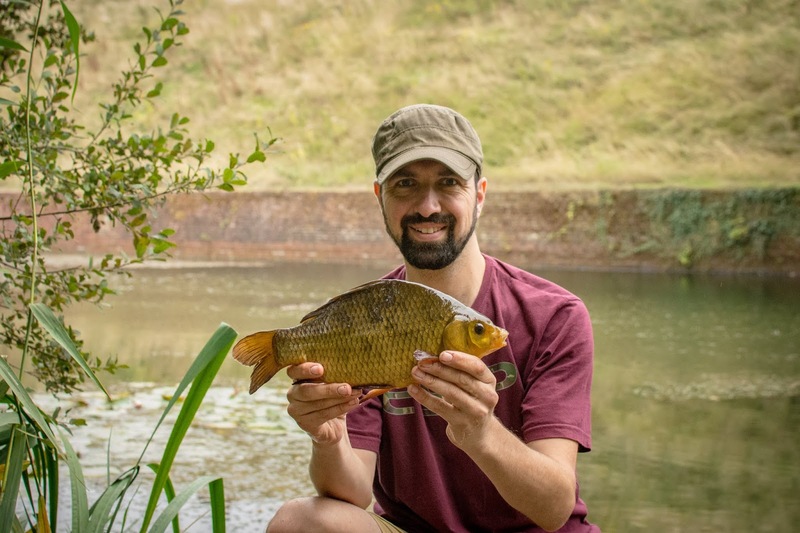 The connection was made, this time clearly not a tench- I caught a glimpse: it was a crucian, albeit one that thought it was a tench! Rather than spiralling aimlessly it darted purposefully towards a weedbed to my right. I managed to kite it round and carefully positioned the net in its path but it dived down deep and found more weed cover just out of my reach. I gently raised my rod tip and the fish came to the surface, bringing with it wreaths of Canadian pondweed about a foot from my outstretch landing net. 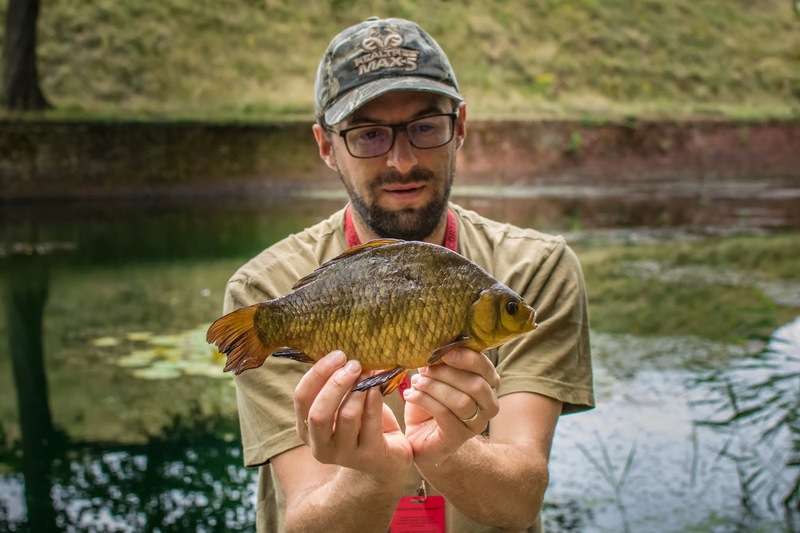 As I slowly brought it closer I could see a beautiful, deep fish, clearly of adequate proportions to fulfil all my crucian dreams! It came within an inch of the rim when suddenly the hook pinged free. I lurched forward to try and scoop the fish up but my efforts were in vain and my prize swam gleefully away. I am not sure I managed to internalise my frustration on this occasion but fishing between good friends Jake and Graeme provided empathic consolation in abundance. I placed the hook on the bottom eye of my rod, tightened up with the ratchet on and went to prepare my swim for the night. On arrival at the moat I had started trickling bait into a margin spot beneath an overhanging tree on my right and into a channel between two beds of lilies on my left and had popped back to this spot mid afternoon to keep this going with a couple of handfuls of boilies scattered around each area. As I arrived back at the swim following my crushing crucian defeat, a huge wave emanated from the margin spot. Perhaps whatever it was had been spooked by me walking up the bank but it was a promising sign. A little more bait went out along with my rigs to each spot. I made use of small PVA bags, partly to protect the hook from the silk-weed that lay on the bottom and from the Canadian pondweed and other flora that were floating in rafts around the swims. Jake was also carping through the night in a nearby swim and he called in to see me before settling down for the night. 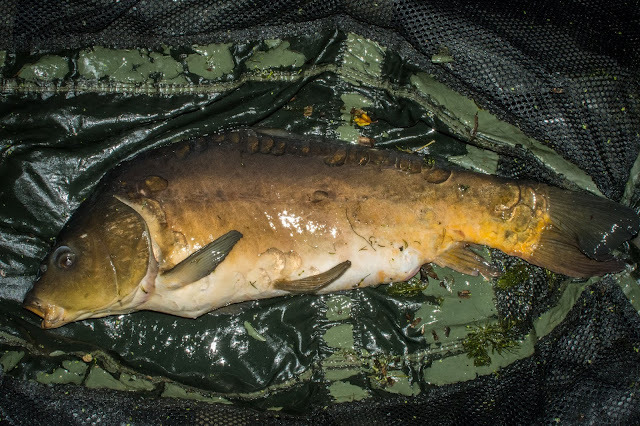 We discussed the moat's 'no braided hook links' rule - one which made sense when considering the potential for tethering in such a hazardous environment but one which put us both outside our comfort zones in terms of bait presentation and rig-mechanics. My left rod was fishing a hinged stiff rig which I have done well with in the past but on the right hand rod I presented a snowman on a fluro blowback D-rig. I know this works well for others but it is not usually part of my repertoire and so my confidence in it was not especially high. We wished each other luck and parted company. After a generous portion of tortellini and a phone call home, I tucked up into my bed chair and started to snooze. I am glad I gained a head start on sleep because it didn't last long. Single blips and 'false runs' plagued me throughout the night. I blamed my rig for the lack of hook-ups. 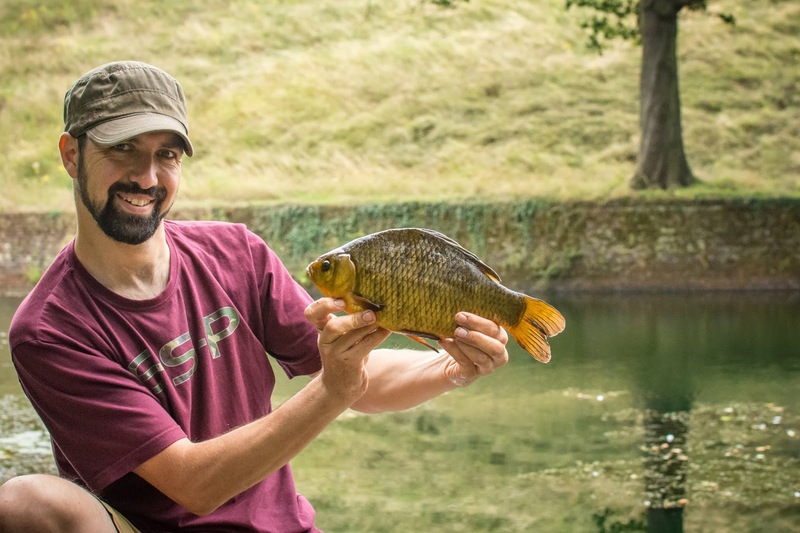 Eventually I reeled in, sharpened the hook and put on a heavier lead but the irritating bites continued, eventually culminating in one I was able to hit at 3 am, leading me to land a fairly decent sized bream. Whilst it did not give me the typical limp-handshake of a fight that typifies a breams usual efforts when hooked and I certainly don't mind catching them on lighter tackle intentionally, tonight this is not what I was hoping for! I contemplated not re-casting so I could get some sleep but decided to chuck the rig back out as it was with an underarmed handful of boilies to accompany it. I instantly regretted this as the line bites and false runs resumed - and sleep did not. So I decided to embrace the day, made a cafetière of very strong coffee and eventually a full English breakfast followed. At about 6am, just as the sausages began to sizzle, my carelessly cast right rod ripped off rapidly. I picked up and bent into a very powerful and determined fish which made an easy arc of my stout carbon carp rod. Thankfully I was adequately gunned to turn this fish from nearside snags and far side lilies but as it tore around the swim from one weed-raft to the next, a huge weight accumulated on my line until eventually it was near solid and exceptionally heavy. Remembering the scaled down but similar situation the day before, I was especially careful as I tried to coax this dead-weight to the net. I managed to get it over the cord and tried to lift the net but as I did the water erupted and the collective mass of fish and weed sped away from me once more. This scenario repeated several times until eventually, as my arm felt like it was about to fall off, I managed to lift the net, securing an incredible carp that still seemed not to have tired. However, due to the time of year and the exertion this fish had made, I rested it for some time in the net before lifting onto the mat for the usual post-capture drill. Photographing this fish gave me a great opportunity to admire its dark, chocolatey tones. What a magnificent creature! 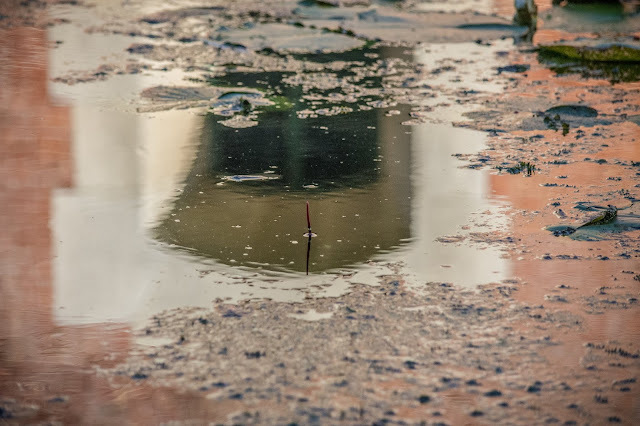 A dark, chocolatey moat mirror! I recast and tucked into breakfast - the ecstasy of my recent capture masking the taste of my slightly singed sausages! Before the fry-up was finished the left rod followed suit as line started fizzing from the spool. By comparison the battle was tame but I rested the fish in the net nonetheless. 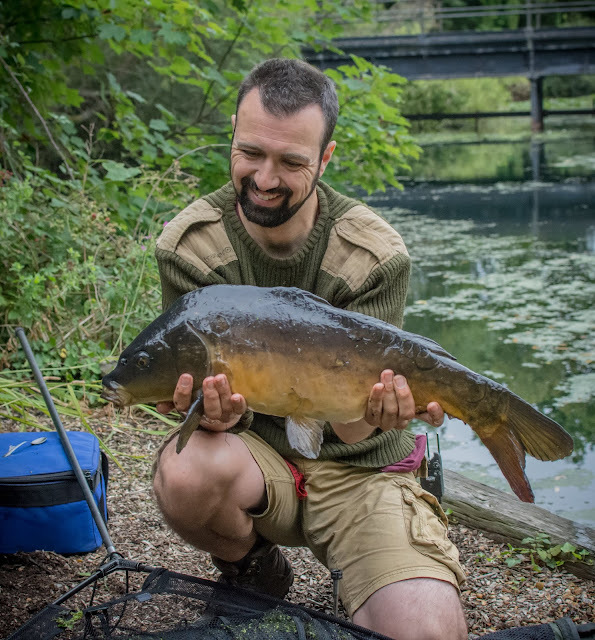 Whilst doing so, head-bailiff Mark popped in to see me and was able to identify my capture by its many quirky features as Ivan - a real character-fish if ever there was one! Mark obliged with a quick photograph and then I slipped Ivan back without too much fuss. We joked about how often Ivan trips up and that it would not be a surprise if I saw him again! I was delighted to capture the characterful Ivan! 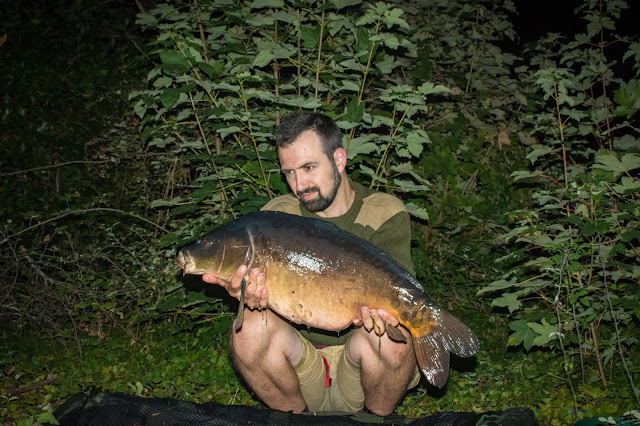 After this I reeled in the carp rods, topped up the free offerings in the swim and went over to the stretch I had fished the day before which was more conducive to float fishing and where I knew a few friends would also be fishing. 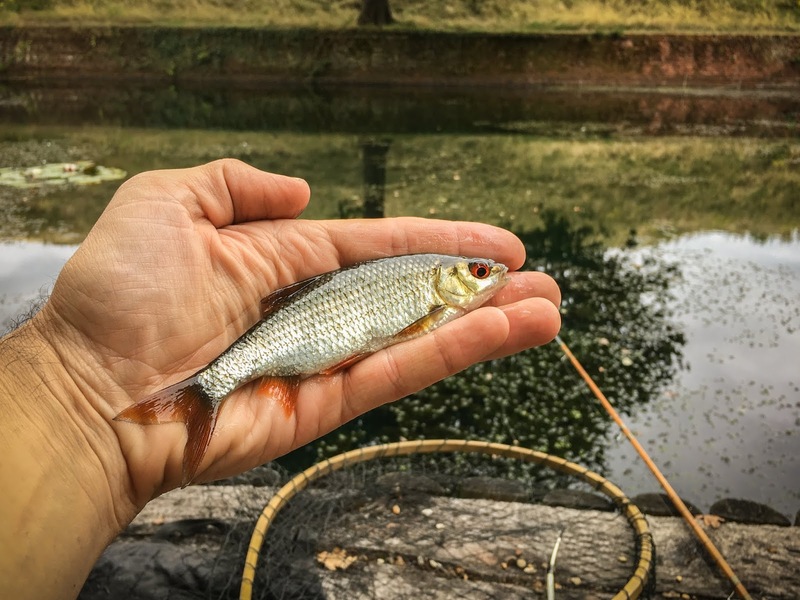 While others were swim raking and building their swims with bait, I continued with my conservative baiting strategy and initially cast my bread flake hook bait with no freebies at all, tight to some lilies extending out from the bank. My float must have sat there for about half an hour without even a twitch and then, with no warning at all, lifted straight up followed shortly by my rod tip. Having made the connection, the fish charged off assertively, depriving me of the gentle bout I was hoping for and had I not caught a golden glimpse, once again doubt would have been cast on the identity of this small cyprinidae. This time with the benefit of hindsight I took extra care to steer this fish around the various obstacles and breathed a sigh of relief when eventually I had it in the net. A crucian from the moat - caught on my own handmade swan quill slider float. Aside from regular rendezvous with small roach, the rest of the day was relatively quiet. As time moved on, I felt increasing pressure to make things happen. By mid afternoon my swim was raked and an accumulating layer of groundbait was keeping the crucians quite occupied, leaving them with no desire to do any more than nudge my hook bait tauntingly. It might not have happened anyway but by now I had definitely wrecked it! I packed up but lingered for a while to see how my friends had fared before returning to my night time swim. Jake also had success with the crucians! I approached the night in the same way as before but with new-found confidence thanks to the morning's fish. I mentally prepared for another sleepless night filled with poorly-timed blips and bobbins yo-yoing aimlessly which, much to my horror, resumed just after 11pm. When finally a sustained drop-back occurred I struck in frustration thinking perhaps I would land this bream then keep the rod in until first light. However, as I struck, it was not a bream I hooked! 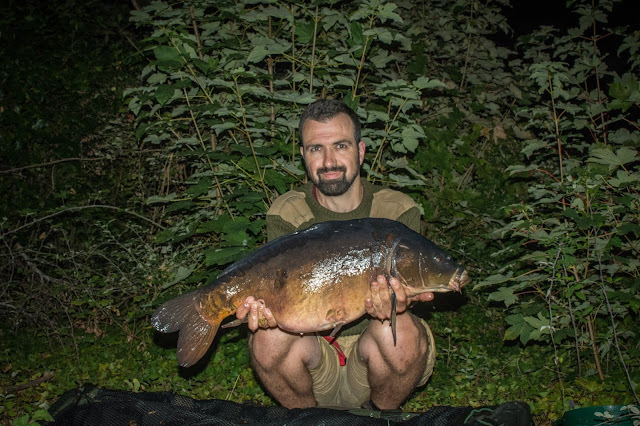 An explosive altercation ensued, not dissimilar to the first fish of the morning but with increased power and the added complication of having to conduct this close-quarter confrontation in near complete darkness. 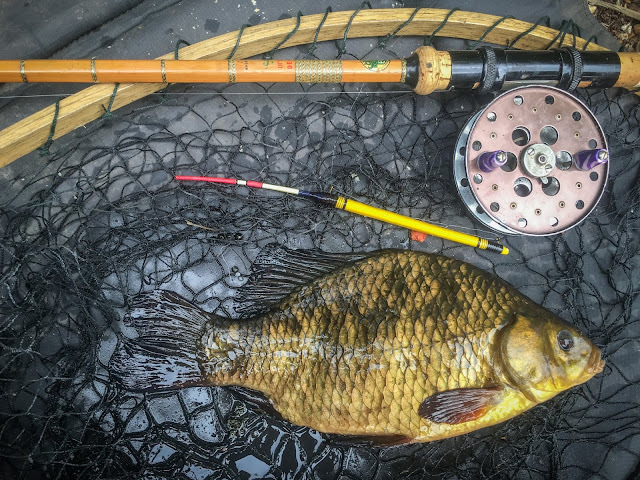 Once this monster of the moat was resting in my net, a message came through on my phone from Jake, who had heard the commotion and was asking if I wanted a hand with photos. I hesitated because I knew he would have to reel in and I didn't want to disrupt his fishing, but as I looked at this incredible fish I realised that I had to accept his offer to ensure the memory was preserved and the fish was well looked after in the process. In no time Jake was round at my swim. He was invaluable in getting this process right and I am extremely grateful! The first of 3 angry mid-double commons that kept me awake! ... and even Ivan decided to pop by to say 'hi'!!! As the sun just started to peek over the horizon, a family of swans decided to have breakfast in my productive margin spot. I couldn't risk hooking one so reeled in and started breakfast. It was now my last my last morning at the moat and so I packed away all but my float rod and made my way back round to try for one last crucian. 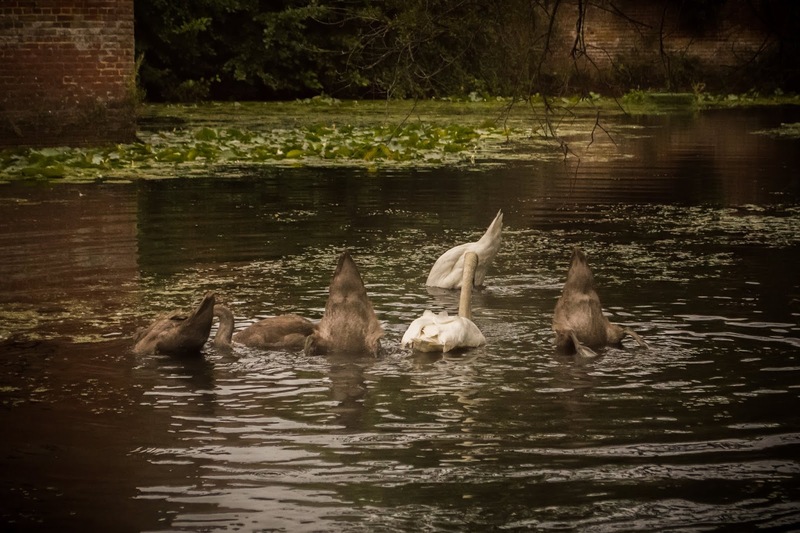 Swans and their signets decimating the swim. My first cast gave me a gift of a lift which I failed to hit as did my second. The third time was indeed lucky - I held my breath as I silently played the fish to my net dedicating all the concentration I could muster to the task. The tension was tangible. 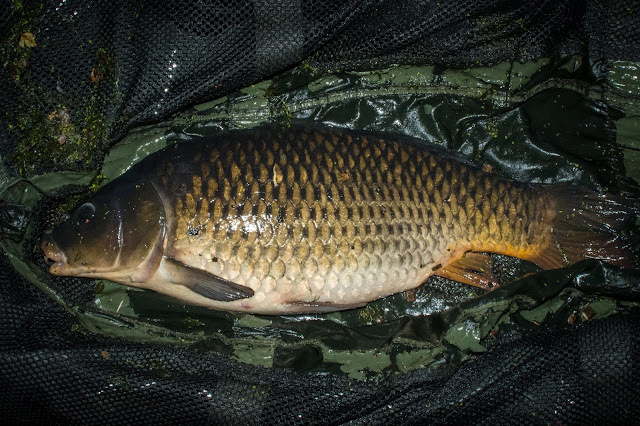 Thankfully there were no complications this time and soon enough I was looking at a beautiful bar of gold on my unhooking mat. Jake, being the good-egg that he is, popped over again and did some photos. I couldn't believe how fortunate I had been. I could have tried my luck for another but decided to quit while I was ahead and get home early to see my wife and daughter, both of whom I was sorely missing. 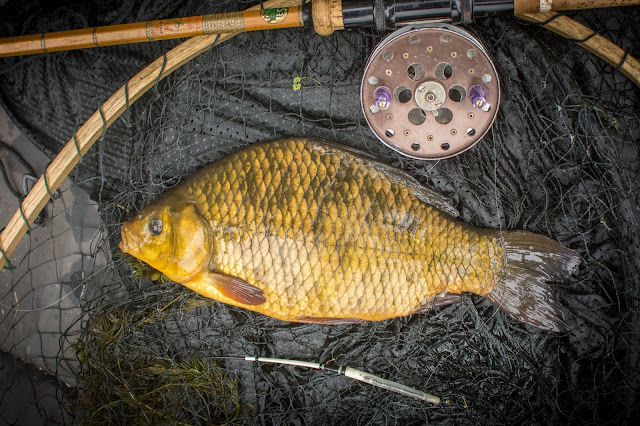 My biggest crucian of the session caught on one of Graeme Pinkerton's delicate slider floats. Just as I was saying my goodbyes I heard a commotion down the bank. 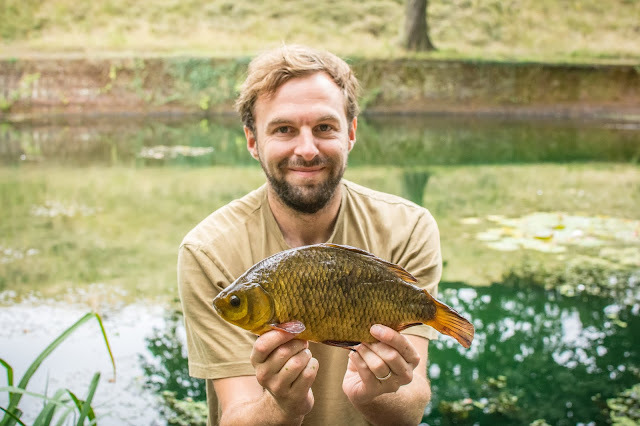 Jake had caught another crucian which gave me the opportunity to repay the favour from the night before with some photos. It had been an absolutely incredible session - 7 carp landed (well, 6 different carp! ), 3 tench, 2 crucians, 1 bream and several silvers! Jake had also caught two crucians, several sizeable carp as well as a number of tench and bream. My other friends all caught plenty - some also did well with the crucians, others enjoyed a steady flow of roach and rudd and the odd carp was caught off the surface. 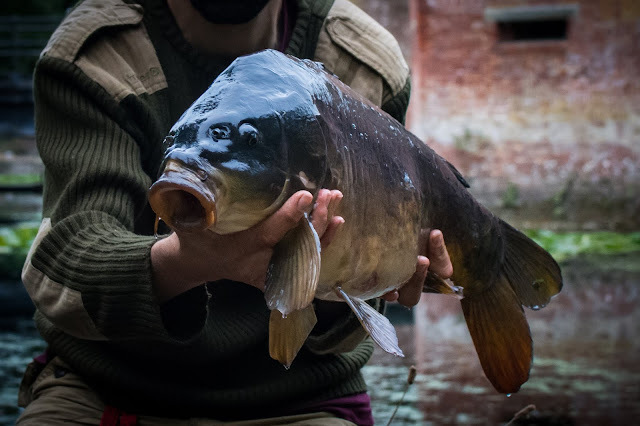 I observed how my success with the carp came partly, I believe, from keeping a steady flow of bait going in to the swim, allowing them to gain confidence in feeding and as far as crucians are concerned, I had the most success where I was restrained in the amount of free food I offered. I had anticipated the weed, which appears thick in places, to be a problem but with a little consideration for bait presentation and by using adequately stout tackle, there was no need for any concern. 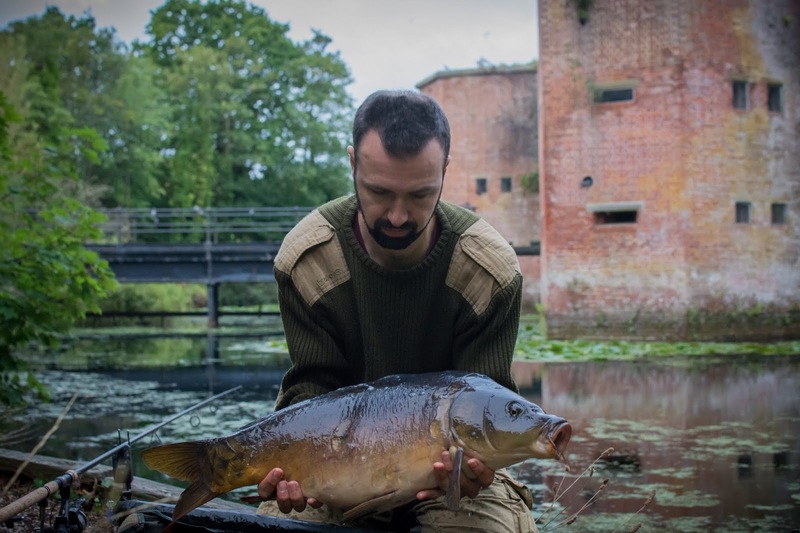 Should I be fortunate enough to return here once more, whilst I would hope to continue to enjoy the carp and crucians, I would like to target the various predators to which the moat provides a home. For now however, I am content and elated having had such a memorable experience.